The "baby side" of this room has lots of colorful, shared baby nursery ideas. What I mean by the "baby side" is that this room is currently being shared by a baby girl and a little boy age 4 and the nursery side is in the picture above. The crib, of course, is on the nursery side. I made a pretty pennant wall decoration using a delightful mix of color and patterns ranging from polka dots and stripes to chevron and geometric prints. I totally believe that the world can NEVER have too many pennants, buntings and banners; I love them and feel that no wall should be without at lease one. Don't ask the name of the baby bedding collection; there isn't one. The pieces were mostly purchased in several different places. One thing that they all have in common is that they were all bargains and purchased at very low prices. You never know what a thrifty shopper you can be until you find yourself working with a very tight budget. The Dwell brand baby bumper and fitted sheet was found and bought for a song on Amazon. Then I bought the fabric to make the crib skirt for $1.99 a yard on clearance sale at IKEA. The fabric was cut to fit and it looks incredible without sewing the first seam! Yeah! A no-sew crib skirt! Let's take inventory before we push ahead. There is a chocolate brown and white bumper pad with polka dots on one side and stripes in the same colors on the other, a fitted crib sheet in aqua and a no-sew (can you tell how impressed I am with this?) bed skirt in red and white fabric that reminds me so much of my favorite peppermint candy. I would like to call your attention to how nicely the individual pieces of the baby bedding reflect the fabric of the flags in the banner. Nice! 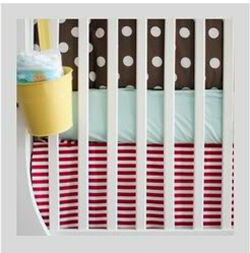 There's nothing that screams "matchy-matchy" or that denotes baby nursery themes of any specific nature. There is simply a subtle hint at continuity that pulls the room together. The blend of fabric of the banner and bedding do tend to draw the eye but not enough to completely steal the show from the bright yellow ceiling medallion and DIY crib canopy. 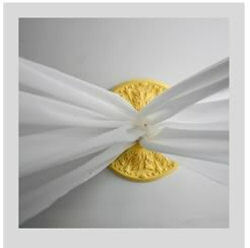 You can see instructions for making the mosquito net, crib canopy that are super easy on my blog. But as we all know; things are never as simple as they sound, especially for the really cute stuff. All it takes is spray painting the ceiling medallion, pulling the 2 sheer curtain panels through and hot gluing them in place and finally screwing the medallion into the ceiling. Could something this great really be that easy? If you try it, would you please let me know so that I might be able to get the hubs to make one for the girls' room? And here is a picture of the perfectly adorable occupant of the girly side of the room. 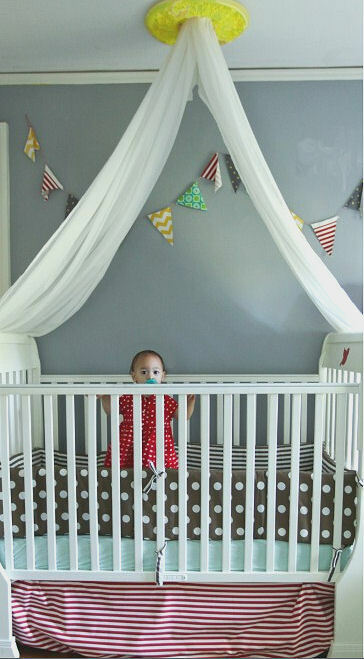 The red dress is the perfect complement of the nursery's decor! Visit me, Jamie, at The Natos and thanks to Unique Baby Gear Ideas for allowing me to "share" my baby nursery pictures and DIY craft and sewing ideas. You will want to visit the blog to see more shared nursery ideas and detailed views of the ceiling medallion making process. Can you tell me the color that was used to spray paint the yellow ceiling medallion? 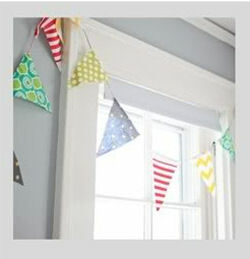 It seems so sunny and cheerful in the photos that I want one for my baby's room.